A lair is a den or a resting place for a wild animal, but it can be used figuratively to refer to any hidden place, especially a secret retreat or base of operations or a place where someone seeks seclusion. As a verb, although rare, it means ‘to serve as a lair’ or ‘to place in a lair.’ In the latter sense, it is usually passive. The wild boar was in its lair. The police discovered the location of the criminal's lair. The teenager finally emerged from her lair at midday. 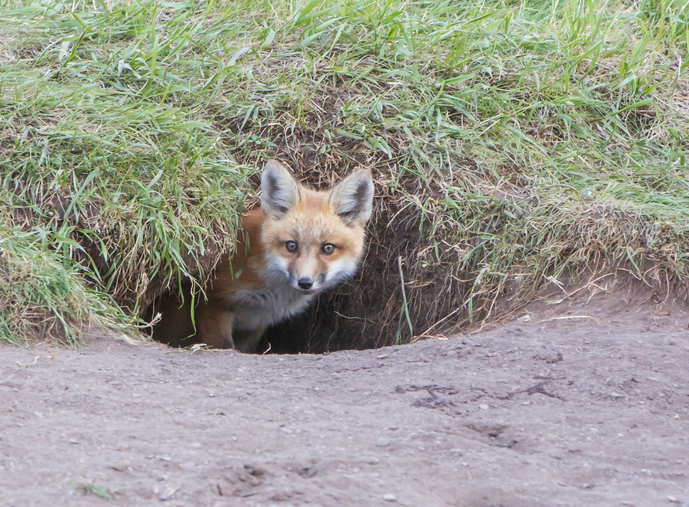 The foxes were laired at the bottom of the field. This wood lairs many animals. One of the early meanings of lair was a bed or resting place. To some extent, this can still be seen in the meaning of a place of seclusion. It tends to be particularly used to talk about teenagers’ bedrooms, which could be seen as a mixture of this early sense and the sense of lair as a wild animal’s den (because teenagers’ tend to have untidy bedrooms). Originally, lair also meant a place for any animal to lie down, including domestic animals. However, it is now almost exclusively used to talk about the dens of wild animals. It is particularly used about animals that are hunted, as they go to their dens to hide, which is why lair has also taken on the meaning of a secret retreat. Lair dates back to before the year 900. The Old English noun leger originally meant ‘a bed or a couch,’ ‘the act of lying down,’ ‘a place for lying down,’ or (figuratively) ‘an illness’ or ‘the grave.’ It can be traced back to the Proto-Germanic legraz and the Proto-Indo-European legh (to lie down or lay). It is related to the Old Norse legr (‘the grave,’ but also ‘nuptials,’ because both are figuratively ‘a lying down’), the Old Frisian leger (situation), the Old Saxon legar (a bed), the Middle Dutch legher ( the act of or place for lying down), the Dutch leger (a bed or camp), the Old High German legar (‘a bed’ or ‘the act of lying down’), and the German Lager (a bed, lair, camp or storehouse), as well as English words such as coverlet, fellow, lager, law, lawyer, layer, litter and low. The meaning ‘an animal’s den,’ and its figurative extension to a place of retreat or seclusion, first appeared in the early 15th century.